The Algerian Air Force (AAF) (Arabic: القوات الجوية الجزائرية‎, Al Quwwat aljawwiya aljaza'eriiya; French: Armée de l'air algérienne) is the aerial arm of the Algerian People's Military. Algerian military aviation was created to support the fight of the People National Army against the French occupying forces. It came as part of the decisions of the Soummam congress held on August 20, 1956, which recommended a long-term plan to form a modern army. A structure was created to train the future pilots. Many pilots were sent to friendly countries such as Egypt, Iraq, Syria, and the USSR, to train as aircraft pilots and aeronautics technicians. During this period, the French colonial army started the lines of Challe and Morrice used to isolate the ALN fighters inside the country and to stop supplies coming from Tunisia and Morocco. Then came the idea to train transport and helicopter pilots to ensure supplying the national liberation army, and to prepare the first core of the military aviation. Training was one of the major preoccupations of the ALN/FLN leaders. Military aviation had a core of pilots and ASDFDASF technicians after independence, who laid the foundations of the present Air Force. The air force branch was born and the first air force units were set up, i.e. a flight of helicopters that was acquired during the revolution, and a flight of combat aircraft. The Algerians authorities sent trainees to friendly countries such Egypt, Syria, Iraq, China, and the USSR, while waiting for the creation of Algerian Air Force schools. In 1966, the Air Base of Tafraoui in the 2nd Military Region was built as an air officers' school (EOA) where the first officer students were received to train as pilots and technicians in aeronautics. During this first decade, immediately after independence, the Algerian Air Force acquired planes from the USSR, mainly MiG-15UTI and MiG-17, and some donated by Egypt. When border clashes with Morocco occurred in 1963, the Algerian government decided to enhance the capabilities of the army and the air force. MiG-17F light bomber, MiG-21 F13 interceptor, Su-7BMK fighter/bomber and some An-12 airlifters were purchased from the USSR. Mi-1 and Mi-4 helicopters were also deployed. During the Six-Day War in 1967, and War of Attrition between 1967 and 1973, two squadrons of MiG-17F, one squadron of MiG-21F13, and one squadron of Su-7BMK were stationed in Egypt to support the Arab coalition. During the Yom Kippur War, the Algerian Air Force participated in the conflict under the unified Egyptian military command. MiG-21F-13s and newer MiG-21PFs were mainly used to protect the Cairo region. MiG-17F and Su-7BMK aircraft also participated in the war, mostly in strafing and bombing missions. In October 1973 two Su-7BMKs, one MiG-21 and a number of MiG-17Fs were shot down by Israel. In 1976, Algerian Air Force planes returned from Egypt to their home bases in Algeria. Shortly after dozens of MiG-23MF, MiG-23BN and MiG-25P were acquired and entered in the inventory. MiG-21F-13s and MiG-21PFs were replaced by higher-performance MiG-21MF and later MiG-21Bi interceptors. The High Command dissociated the Air Defense of the territory from the Department of the Air Force, which was built in 1986 as an air force command. During this period few changes occurred in the combat aircraft inventory of the Algerian Air Force. Ten Su-24MKs were received from the USSR, while the MiG-17F was phased out. A new airplane supplier emerged just after the Iranian revolution when Algeria received 18 C-130H Hercules, 12 T-34 Mentors, and 12 Hawker Beechcrafts supplied by USA from 1981 to 1989, for transport and training. The Air Force purchased a large number of MiG-29s (index 9.13) from Belarus and Ukraine from 1999 to 2003. At least 25 Su-24MKs were also acquired during the same period. After the large military deal concluded with Russia during March 2006, Algeria ordered 28 Su-30MKAs, 16 Yak-130As, and 34 MiG-29SMTs. In 2008, the MiG-29 SMT contract was cancelled and the planes delivered were returned to Russia and exchanged for 16 Su-30MKA multirole fighters. 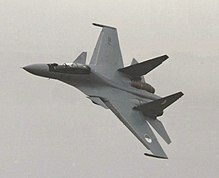 While the current front-line fleet primarily consists of Russian-origin aircraft such as the Sukhoi Su-30 and the MiG-29, Algeria has expressed an interest in acquiring aircraft from China. Algeria has been seen as a potential operator of the Chinese 4th-Generation JF-17 Thunder fighter project. See also List of airports in Algeria for other airfields which may have a dual civil-military function. The air force has two regiments of Fusiliers Commandos de l'Air, primarily base defence troops but which have reportedly taken part int anti-terrorism operations. They are the 772nd and 782nd Regiment des Fusiliers Commandos de l'air (RFCA). On April 11, 2018, an Il-76 strategic airlifter crashed in a field shortly after taking off from Boufarik Airport. It resulted in 257 deaths. ^ "War of Attrition, 1969–1970 – acig.org". Acig.info. 2009-05-11. Archived from the original on 2014-08-08. Retrieved 2012-09-15. ^ "Algeria". Ejection-history.org.uk. Archived from the original on 2012-09-18. Retrieved 2012-09-15. ^ "Israeli Air-to-Air Victories in 1973 - acig.org". Acig.info. 2009-05-11. Archived from the original on 2013-06-16. Retrieved 2012-09-15. ^ Centre Francais de recherche sur la reseignement, Bulletin de documentation 5 Archived 2015-01-11 at the Wayback Machine, accessed January 2014. ^ a b c d e f g h i j k l m n o p q r s t u v w x "World Air Forces 2019". Flightglobal Insight. 2019. Archived from the original on 23 January 2019. Retrieved 5 January 2019. ^ "L'Algérie donne un coup de fouet à ses capacités de reconnaissance - MENADEFENSE". MENADEFENSE (in French). 2016-06-19. Archived from the original on 2018-02-22. Retrieved 2018-02-27. ^ "Senate Executive Communication 3943 - Executive Communication - 115th Congress (2017-2018)". www.congress.gov. Archived from the original on 2018-02-05. Retrieved 2018-02-27. ^ "Airbus A340 MSN 917 - 7T-VPP". airfleets.net. Archived from the original on 1 January 2015. Retrieved 1 January 2015. ^ a b "Indiscret : L'Algérie s'apprêterait à acquérir des avions espions italiens - Algérie360.com" (in French). 2018-01-11. Archived from the original on 2018-01-13. Retrieved 2018-01-12. ^ a b Akramov (2018-05-17). "Une upgrade du Mi171 en format tueur de char pour l'Algérie". MENADEFENSE (in French). Archived from the original on 2018-11-05. Retrieved 2019-02-01. ^ "Algeria's Mi-171 helicopters upgrade program about to be completed - News - Russian Aviation - RUAVIATION.COM". www.ruaviation.com. Retrieved 2019-02-01. ^ "The Super Hind Mk.III Could Be the Best Mi-24 Ever". Archived from the original on 2018-02-25. Retrieved 2018-03-05. ^ "Trade Registers". armstrade.sipri.org. Archived from the original on 2011-01-31. Retrieved 2018-03-12. ^ "Trade Registers". armstrade.sipri.org. Archived from the original on 2011-01-31. Retrieved 2018-03-17. ^ "AgustaWestland Looks To Recertify AW101". aviationweek.com. Archived from the original on 1 January 2015. Retrieved 30 December 2014. ^ Allport, Dave (July 2013). "First Algerian VIP AW 101 Flight |Testing". Air Forces Monthly. ^ a b "Trade Registers". armstrade.sipri.org. Archived from the original on 2011-01-31. Retrieved 2019-02-01. ^ "Шойгу доложили о замене иностранной авионики на российскую в Су-30СМ". www.mk.ru (in Russian). Archived from the original on 2019-02-17. Retrieved 2019-02-16. ^ "AviationsMilitaires.net — ECA Firnas-142". www.aviationsmilitaires.net (in French). Archived from the original on 2018-02-14. Retrieved 2018-02-27. ^ a b Aeronautique.ma. "Des avions... made in Algeria". Aeronautique.ma (in French). Archived from the original on 2017-10-14. Retrieved 2018-02-27. ^ "AviationsMilitaires.net — ECA Safir-43". www.aviationsmilitaires.net (in French). Archived from the original on 2018-02-14. Retrieved 2018-02-27. ^ Akramov (2018-12-20). "2018 l'année des UCAV en Algérie". MENADEFENSE (in French). Archived from the original on 2018-12-21. Retrieved 2019-02-01. ^ Akramov (2018-10-30). "Première apparition officielle des CH 3A et CH 4B en Algérie". MENADEFENSE (in French). Archived from the original on 2018-10-31. Retrieved 2019-02-01. ^ "AviationsMilitaires.net — Denel Seeker". www.aviationsmilitaires.net. Archived from the original on 2018-10-31. Retrieved 2019-02-01. ^ rédaction, La (2013-07-07). "Premier drone algérien "Amel" : défi relevé à Sidi Bel-Abbès". Algerie Focus (in French). Archived from the original on 2019-02-02. Retrieved 2019-02-01. ^ "AL Fajer L-10. Spécifications. Photo". avia-pro.fr. Archived from the original on 2019-02-02. Retrieved 2019-02-01. ^ "AviationsMilitaires.net — Meteor/SELEX Galileo Mirach 100". www.aviationsmilitaires.net. Archived from the original on 2019-02-05. Retrieved 2019-02-04. ^ "257 killed as military plane crashes in Algeria". RT International. Archived from the original on 2018-04-11. Retrieved 2018-04-11. Wikimedia Commons has media related to Air force of Algeria. This page was last edited on 15 March 2019, at 23:23 (UTC).